Guru Rinpoche watches over the valley he created long ago as a refuge for dharma in troubled times. Rolwaling Valley is theoretically accessible by a half-dozen routes. Most trekkers approach via Simigaon, at the confluence of the Rolwaling Khola and the Bhote Khosi (which is known as the Tamba Kosi south of this point. There are three routes leading to Simigaon. One, from Tibet via ....to the north, is not used by foreign tourists. There is a path that crosses the ridge west of the Tamba; the trailhead is at Barabise, on the Friendship highway, which connects Kathmandu with the Chinese border. The other route to Simigaon is by far the most convenient. The trailhead is at Dolakha, at the end of a spur of the Swiss highway to Jiri, which breaks off to the north at Charikot. The main path drops to the Tamba and then heads straight north until Dolakha, but there are some alternative paths that cut the corner and drop into Rolwaling Valley above Simigaon. There are three routes over high passes, requiring guides and proper mountaineering equipment. Two of these converge at Na, about 1.5 hours east of Beding, while the third hits Rolwaling Valley near Beding itself. The more frequented of these connects Rolwaling with Khumbu, crossing the formidable Tashi Laptsa pass above the headwaters of the Rolwaling Khola. It is also possible to approach by cutting more or less due north from Jiri, and crossing the Yarlung La above Na. Other trails that converge at this pass connect Rolwaling with Suri Dhoban and with the Junbesi area. Menlung pass, just above Beding, is a short cut to Tibet, but the glacier is supposed to be a bit tricky, and the route is not officially open. Although there are reports of Maoist activity in the general area, particularly in the Tamba valley, we have heard of no attacks on tourists. On the other hand, our Sherpa friends were adamant about the inadvisability of taking the Barabise route due to the frequent incidence of banditry. Those determined to avoid retracing their steps may want to consider one of the highland trails; however, camping gear and a guide are essential for Tashi Laptsa and strongly recommended for the other routes as the trails are not well-marked and there are no regular teahouses or lodges for rather long stretches. More information about the trek into Rolwaling from Barabise can be found in Trekking in the Everest Region by Jamie McGuiness and in Trekking and Climbing in Nepal by Steve Razzeti. 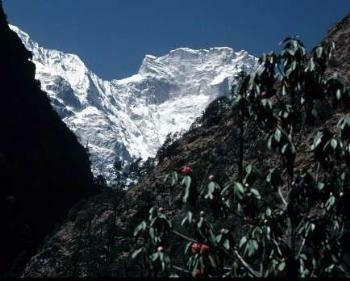 The trek from Dolakha to Beding is the quickest and easiest route into the valley, taking 3-5 days. It offers a wide range of environments and numerous outstanding vistas. Ranging in altitude from 800m to 3600m, this trek covers a large number of Nepal’s varied ecosystems. The express bus from Kathmandu to Dolakha takes about 5 hours, while the local bus can take as long as 7 or 8 hours. Dolakha is a large bazaar town at the end of the paved road. It is also the district seat and a popular retreat for Nepali and Indian Pilgrims. There are several lodges, with the most accessible and the one best geared for tourists being the Dolakha Lodge, immediately uphill from the bus station. It is possible to arrange porters in Dolakha if needed. The normal rate is about 300 Rs. per day. Note that if you have porters they will probably insist on taking five days, or at least getting paid for five days. Food, lodging and tips for the porters are not included in this figure, but are usually expected. The guided group treks typically stop in Singate, Jagat, Simigaon, and Drongkhang before reaching Beding; these villages have the best established tourist infrastructure and the highest number of visitors. It is possible to stay in most of the other towns along the way, but you should expect very simple accommodations. The express bus generally reaches Dolakha around noon. If the bus arrives early enough, it is possible to begin the trek immediately. Otherwise, the hike begins the following day with a long, steep descent. From the Dolakha lodge, turn left work your way down and through the sprawling village. At the first stupa, bear to your right, and then again around toward the left. Ask the locals to point the way to the right trail. “Singate jaane bhato?” (Singate-going path?) will usually elicit a comprehensible response. It is important to note that very few people along this trek speak little more than rudimentary English. Therefore, a basic understanding of simple Nepali phrases will be helpful. A phrase book could come in handy as well. Once on the trail, it takes 1-1½ hours to reach the suspension bridge over the Doni Kosi. For those coming directly from the bus, there is a simple lodge immediately before the bridge with excellent food. The elevation here is about 800m. From the bridge a short uphill brings you to Nagdaha where it is also possible to stay in simple teahouses. The path continues its gentle climb along the Tamba Kosi, occasionally jumping up and down to avoid obstacles. Although there are numerous teahouses spread out along the way, the next major village and substantial lodges are found in Piguti (2-3hrs from Nagdaha). This large town has at least three lodges in the main square. Immediately after leaving the town, the trail crosses a suspension bridge before continuing along the northern side of the Tamba Kosi toward Singate, somewhat less than an hour away. Wind your way through the numerous gardens and fields of this pleasant town to yet another suspension bridge. After crossing the bridge, look to the right for the Malla Hotel. Other accommodations may also exist. If you are leaving Dolakha on the same day you arrive by bus from Kathmandu, you should not expect to go much further than Singate. Leaving Singate, the trail passes a police checkpost that was recently destroyed by the Maoists. The path begins to jump up and down with increasing frequency through this next stretch, avoiding numerous cliffs and landslides, and often clinging to the hillside above dramatic drops to the river below. After about ¾-1 hour you will reach the first bridge and a small village on the far side. Another 30 minutes brings another bridge and the village of Suri Dhoban. Like most villages along the way, it is possible to stay here, but the lodging is quite modest. From Suri Dhoban, the trail immediately jumps up a steep hill to a small chorten before continuing the ups and downs along the southern side of the Tamba Kosi. Eventualy the trail gives way to flatter terrain and several cultivated fields. 30-45 minutes after leaving Suri Dhoban brings another small series of teahouses. Along this stretch of trail, numerous cascades tumble down the steep cliffs and into the river below. Manthale, the next substantial village, is about 1¼ -1½ hours away. There is little in the way of services here, but another 45 minutes leads to the suspension bridge across the Tamba Kosi and into Jagat. There are two lodges here, both immediately across the large bridge. The food and hospitality at the "New Lodge" are particularly good. Leaving Jagat, the trail begins to get trickier. The ups and downs become more numerous and the terrain gets rougher. The trail enters a steep walled gorge with countless waterfalls and other surprises lurking around every turn. The mellow Tamba Kosi turns into thundering whitewater. A single small teahouse and a school are reached 1¼ –1¾ hours after leaving Jagat. Cross the small tributary using the suspension bridge or take the shortcut over the bamboo bridge below. It is at this point that the trail from Barabise meets up with the trail from Dolakha. A few minutes later you will reach the village town of Gongar and a few simple lodging options. A rest break at the next group of teahouses, called Chechet, is advisable (2¼ - 2¾ hrs. from Suri Dhoban): the most difficult part of the hike is just across the river. At the last cluster of teahouses, keep an eye out for the trail down to the river and across the suspension bridge. Turn left, and, as you climb up the path along the scar of a recent landslide, keep a watch for the playful monkeys who frequent the cliff faces along this short stretch of trail, but don’t take your eyes off the trail for too long or you’re likely to lose your step and end up back where you started! A very steep and sometimes hair-raising scramble brings you to the picturesque village of Simigaon sprawling over a terraced knob (1600-2000m) You may reach the first teashop in about an hour, but don't celebrate just yet: you still have 45 minutes or more to go! Once in Simigaon, make your way to the lodges on the ridge at the very top of the town. The trail through Simigoan splits into numerous small paths making it difficult to pick the simplest route. Follow the broadest trail past the first large mani wall and through the open field before breaking left to head up to the ridge above. Ask the locals to point the way to the gompa. There are two lodges here; the one closer to the gompa is decidedly better equipped to receive independent trekkers. From the saddle, there are excellent views of Gauri Shankar and the steep valley walls below. The next day you will climb sharply up, following a brief descent. It is here that you begin to get a feeling for the true remoteness of the valley. If you have been uncomfortable in the subtropical heat of the Tamba Valley, even in late fall or early spring, you will appreciate the much cooler temperatures of the higher elevations. After turning the corner, in about 15-20 minutes, you will enter the deep humid forest of the lower Rolwaling Valley; you will begin to have an appreciation of the true isolation of this sparsely inhabited region, and probably have no trouble believing reports of leopard in this area. The trail soon begins to descend steeply in three drops of 60-100m, then levels out and reaches a single farmhouse only 75m or so above the river; here you may buy tea or a meal. Afterwards you will climb through a series of switchbacks, cross a small bridge, and continue on through the forest. This is the only stretch where the trail can be confusing. For the most part, you may choose either side when the trail forks; generally you can simply choose the broader path. 1-1½ hours after the first ramshackle teashop, you will come to a rather more substantial teahouse. A few minutes later you will come to a fork, with one branch descending to the left and the other bearing straight ahead; you should choose the latter. Both trails eventually meet up again later, but the upper trail is more traveled and offers a spectacular view of an incredible waterfall. Some ten minutes later, you will come to a waterfall, and then another fork: here you should go upwards again and then to your left. The climb continues, eventually easing into a pleasant traverse with excellent views of the valley below and the mountains above. About 3½ hours after leaving Simigaon, you will reach Kelche, a small cluster of huts with one or two teahouses on something of a crest; there is a table with seats on your left, across from the teahouse. From here, it is only about half an hour down to Drongkhang, a series of three teahouses in a clearing festooned with prayerflags by the river. This small squatters camp was nonexistent ten years ago, it has sprung up recently to cater to the needs of trekkers and their porters. Our groups have always stayed at the middle of the three: there are no beds, but it is surprisingly clean; but sharing floor space next to the cooking fire is a great experience and the food is outstanding. In any case, you should probably stop here: the next major village, Beding, is a good four hours away; two years ago there was a tea house about midway, but it was not functioning last fall. The last part of the climb from Drongkhang to Beding is filled with breathtaking views and almost no sign of human habitation. After Drongkhang, the mixed forest is not so dense; in fact, it was pretty much cleared by a forest fire a few decades ago, and most of what you see at first is new growth. The trail begins with a short climb, but is on the whole a gentle and pleasant ramble close to the river -- except for one 10-minute climb straight up to a new bridge, and then straight down. You may be tempted to continue on the old path along the river at this point, although it is somewhat overgrown; this is probably a bad idea, as the tributary stream is a treacherous obstacle: those rocks are extremely slippery! Continuing through rhododendron forests and mossy boulders, you will reach a suspension bridge across the Rolwaling Chhu about one hour after leaving Drongkhang. The vegetation on the other side of the river opens up and is much dryer due to the southern exposure. Great views and towering cliff faces surround you. The impressive peak on the north (left) side of the valley is called Tabayabum. The trail levels off slightly after ¾-1¼ hours, offering great views of Chekigo. Beding is tucked against the northern side of the valley, directly below this peak. Another 30-45 minutes brings the trail back alongside a temporarily calm stretch of the Rolwaling Chhu and a fork in the trail. The trail coming in from the left and across the log bridge is the high route over the Daldung La that is used when the regular trail is impassable during the monsoon. The prayer flags and katas in the trees and surrounding area mark the Samtar Gora, a site sacred to many Hindus as well as Buddhists. This locale was revealed as the dwelling place of Chi Gora (Nai Devi) when a yak was found to be spilling milk at the spot every night. Twice each year, the Sherpas make offerings of milk at the small shrine. Lowland Hindus make the trek each November to present their offerings. The trail to Beding continues straight ahead. In a half hour, perhaps a bit more, you will come to the first of the winter settlements, called Nyimare, which is marked by a row of mani stones. Beding is now only ¾-1 ¼ hrs away. Before reaching Beding, the trail passes the other winter settlements of Ramding, Gyabrug and Chameka. These villages are named for their physical attributes. Nyimare means “good sun” or “early sun,” Gyabrug means “late but warm sun,” Ramding refers to the avalanche-prone waterfall across the river, and Nyimare means “wolf no” referring to the trees that were cut to destroy the habitat of livestock killing Jackals. There is a teahouse on the hill just above the great tree right after the bridge over Jomo'i Gul Chhu. Enter Beding, passing below the brightly painted new gompa gate (a project of the Bridges 2001 team) In Beding there are four new lodges with astoundingly beautiful signs and English menus (also the work of the Bridges 2001 team); just about anyone, though, will be willing to offer a bed or floor space as well as a meals for a reasonable price. At our last visit, the lodges themselves were little more than private homes with limited space for visitors, but guests are eagerly welcomed. All four plan additions and improvements to be ready by spring 2002; Lama's Om (Home!) Lodge is planning to upgrade to a full-scale lodge this year. If you are at all flexible in your expectations, you will have no trouble at all finding a place to stay.